Her body quaked. “I can’t! Van, I’ve had the same dream all week long. You can’t go! If you do, you could be—” Tears spilled down her cheeks as she buried her face in his chest. The following morning, Claire’s eyes were bloodshot as she spooned up four bowls of oatmeal. A loud crack of thunder made her gasp and jump just as Van and the kids entered the kitchen. She nodded and sucked back her tears as he and the kids stepped outside. A few minutes later, Van came back in with a red face. His stride was purposeful as he headed to the kitchen sink and washed his hands. Time to chat: Do you believe visions can sometimes accurately predict the future? Do you believe we’re sometimes sent dreams for a reason? Today we learn the fate of our friends introduced to you in yesterday’s Micro-Fiction Monday. Lloyd held up his hand and pursed his lips. “No! I can’t take room 210. I’ll pay anything. I just can’t take that room.” He reached in his coat pocket for his wallet. The bartender brought their drinks. As she twirled her swizzle stick in her drink, Lloyd noticed her gold ring was in the shape of a serpent with two ruby eyes. His body tensed, and his heart thumped loudly. The red-eyed snake! He shot out of his seat. “No! Noooo!” He threw his glass to the ground, and it shattered. The color drained from his face as he raced out of the club car. Ruth gasped and jumped to her feet. “Lloyd! Mr. Hartley!” She set down her drink and chased after him. As Lloyd turned the corner, he practically ran into the door with 210 in large brass numerals. His throat tightened and threatened to suffocate him. He turned and saw Ruth approaching. He gasped for air. “No! Get away from me!” He rushed down the narrow corridor until he reached the wall. He looked over his shoulder and saw her at his heels. “Noooo!” His eyes squeezed shut as he grabbed blindly at the emergency cable. As the train screeched to a halt, the metal wheels grinded on the track and made a piercing sound in the otherwise quiet night air. Lloyd fell forward and hit his head on the wall. Nearly a half hour later, Lloyd’s eyes fluttered open. He was lying in the dome lounge, and a bright light shone in his eyes. Ruth towered over him with a small smile on her lips. Something red covered her hands. It’s blood! He gasped and made a gurgling noise as he attempted to sit up. Time to talk: Have you ever ridden on a train? Have you ever been afraid of someone as soon as you met them with no particular reason? Lloyd handed him two dollars and opened his door. “Thanks. Keep the change.” He grabbed his suitcase and briefcase, then slammed the door. As he headed inside, a woman approached him. “Uh, no, that’s okay.” Lloyd checked his watch. “I don’t mean to be rude, but I don’t want to miss my flight.” He attempted to step around her. Lloyd narrowed his eyes at her and hurried his gait. Without replying, he turned a corner and jogged toward the gate. As he arrived at the gate, he pulled his ticket from his suit pocket and offered it to the stewardess. “I’d like to check in for my flight to Chicago Municipal. I was afraid I was going to miss my plane.” He chuckled nervously and straightened his tie. His chest deflated, and his temples started to throb. “Alright, thanks.” Thanks for nothing. He sighed and headed back outside to flag down a cab, going out of his way to avoid the band of gypsies. Well, that’s all for today, friends. Be sure to come back tomorrow to see what happens. Time to talk: Have you guessed the year in which the story takes place yet? Have you ever ridden in a taxi? I don’t know what to think of this… I think the Grim Reaper tapped me on the shoulder recently. I’ve been helping an attorney friend of mine for the past few months by producing his TV commercials in my spare time. Spare time? What’s that? Actually, I’m writing, directing, and producing more than a dozen of his commercials. How cool is that? Anyway, a couple of weekends ago, we were with a film crew outside an old courthouse where we were filming part of the first commercial. It was really hot outside (Sorry, Northern neighbors! ), so the attorney had to go to his car and get a cold drink and touch up his makeup. Time to talk: So what do you suppose this means? Is this some sort of bad omen? Is this a harbinger of my own pending demise? Have you ever had a brush with death? Have you ever been singled out by the Grim Reaper? 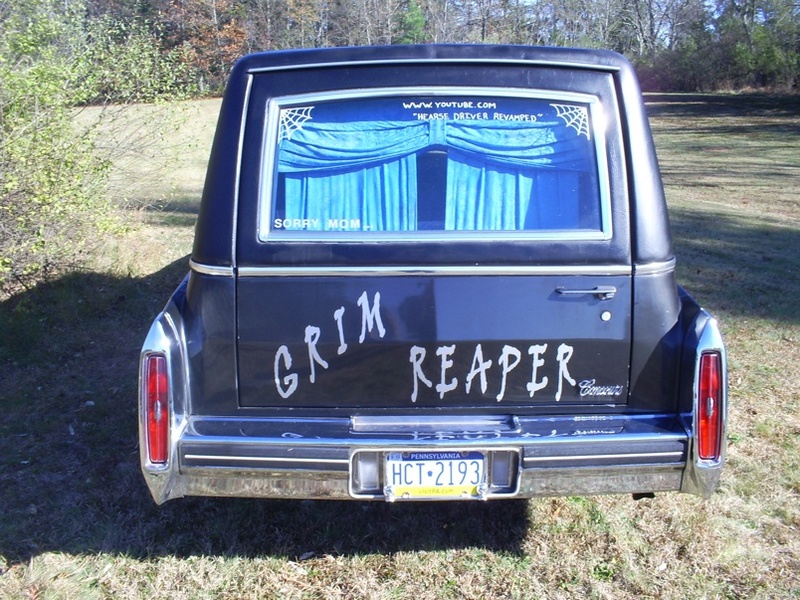 “My” hearse didn’t actually have “Grim Reaper” on the side as obvious as this, but the meaning was there just the same. The hearse that singled me out wasn’t as cool as this old one, but it was just as creepy. Did you ever watch (or at least hear of) the television show Medium, starring Patricia Arquette? If so, then the name Allison DuBois rings familiar. The show was based loosely on real-life medium Allison DuBois who was born on January 24, 1972. Mrs. DuBois claims that she became aware of her ability to communicate with the dead when she was six years old, and she has used her psychic abilities to assist law enforcement in solving crimes. Besides being a world renowned medium and lecturer, she’s authored four books, including: Don’t Kiss Them Good-Bye, We Are Their Heaven: Why the Dead Never Leave Us, Secrets of the Monarch: How the Dead Can Teach Us About Living a Better Life, and Talk To Me—What the Dead Whisper in Your Ear. Time to talk: Did you watch the TV show Medium when it was on? Do you believe certain people can really communicate with the dead? If you personally needed a crime solved and a medium offered help, would you listen to what they had to say?